This post is sponsored by FoodSaver®. All opinions are my own. 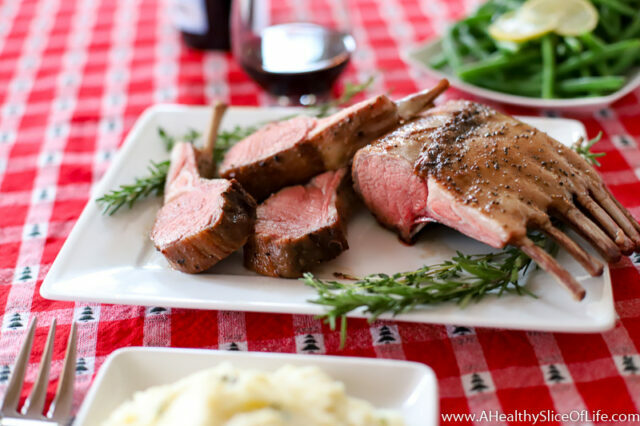 Impress your guests without the stress with this perfectly cooked and simply seasoned rack of lamb. 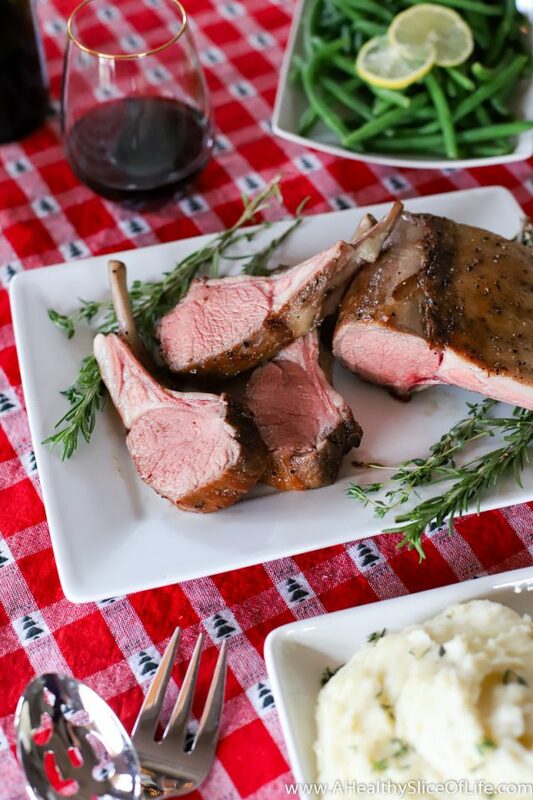 With the help of FoodSaver® technology and the sous vide style of cooking, you can create consistent and delicious results for all your holiday dinner guests. We are in the full swing of Christmas things right now. We have visited the North Pole on the Polar Express, watched all the claymation Christmas classics, and viewed more Christmas lights than we can count. The best part of this Christmas though is that I get to HOST. This year my mom, dad, brother, SIL (my sister-in-law), two nieces, and their Au pair are coming to spend the holiday at our house. The last time I hosted was 7 years ago and to say I’m excited is putting it lightly. While it can be stressful, I also find a lot of joy in decorating the house, getting the rooms ready, and most importantly, planning the FOOD. I’m envisioning breakfast casseroles, cinnamon rolls, a big batch of seafood gumbo, and plenty of snacks and appetizers on hand at all times. In fact, I imagine most of our eating will be casual (because four kids under 6). However, Christmas dinner is one meal I look forward to making a little more special. I am so looking forward to setting the table, using our Christmas dishes, lighting candles, and making it an experience. This also means a fancier entree, which excites me! Once upon a time I would get really intimidated by expensive cuts of meat because I envisioned dropping serious cash then totally screwing it up while cooking it. That resulted in more pressure then I cared to deal with but now it’s a whole new (and less stressful) ballgame thanks to my FoodSaver® FM5000 2-in-1 Food Preservation System and Anova Sous Vide Stick. We started cooking sous vide a couple years ago and I am still giddy every time I pull out a perfectly cooked steak, chicken, seafood, or even asparagus. 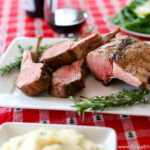 The term sous vide (pronounced soo–veed) is a French term, meaning under vacuum. Sous vide is a cooking technique in which vacuum-sealed food is immersed in a water bath and cooked at a very precise, consistent temperature. The result? Perfection. Truly. It’s actually how many high-end restaurants get their steaks so tender and perfectly cooked. And I love that now I can achieve the same results at home and not worry about screwing up my pricey piece of meat. 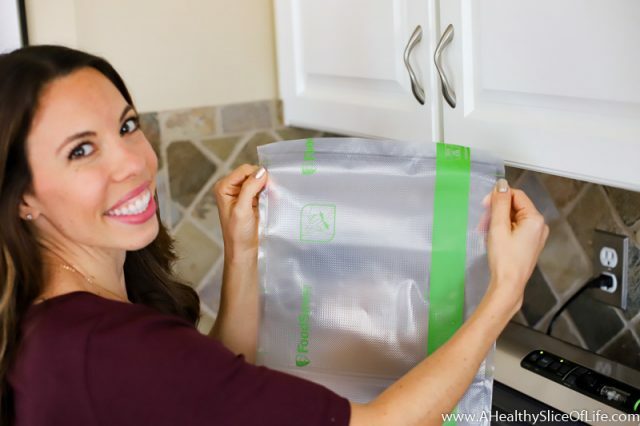 It’s more simple to achieve five star quality at home than you may think, and it’s so easy to achieve using the FoodSaver® System with its vacuum sealing technology It’s the best way to keep the food as air tight as possible while cooking in a water bath. 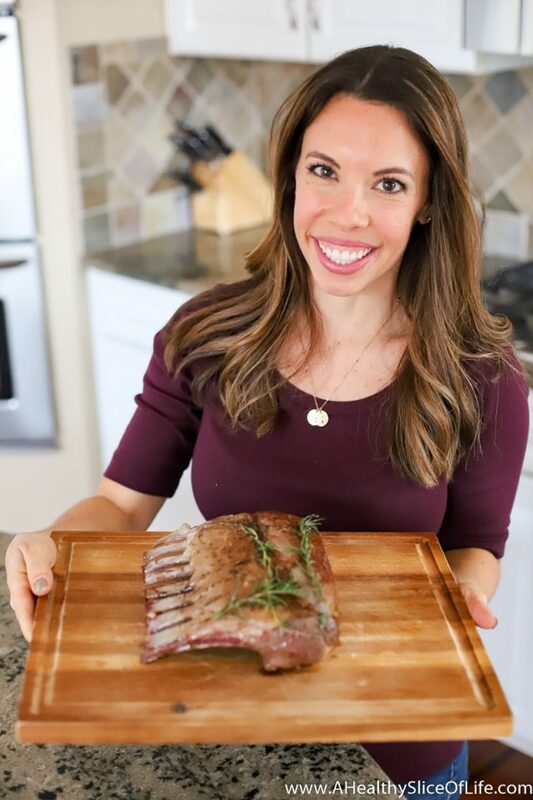 I wanted to show you how easy it was so I chose a rather intimidating cut- rack of lamb. The basic breakdown is simple. First you fill your tub of water and insert the sous vide stick, setting the water to temperature to reflect your desired doneness. While the water begins to heat up, season your lamb with salt and pepper. 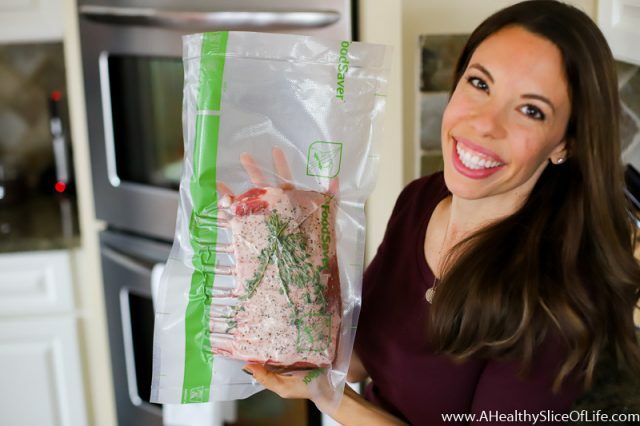 Using the FoodSaver® System, it’s easy to create the perfect size bag for your specific cut of meat. Simply pull on the roll until you reach your desired size, then with the touch of a single button, seal and cut. 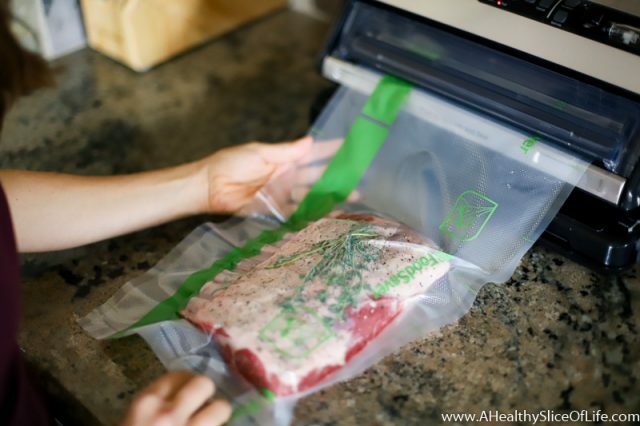 Once you have your bag, slide the cut of meat into the bag and add fresh herbs. Then, again with a single touch, vacuum and seal the bag. Then you simply put the bag into the tub of water, ensuring it is fully submerged. After two hours, you remove the lamb from the water, cut open the bag, and pat the meat dry. 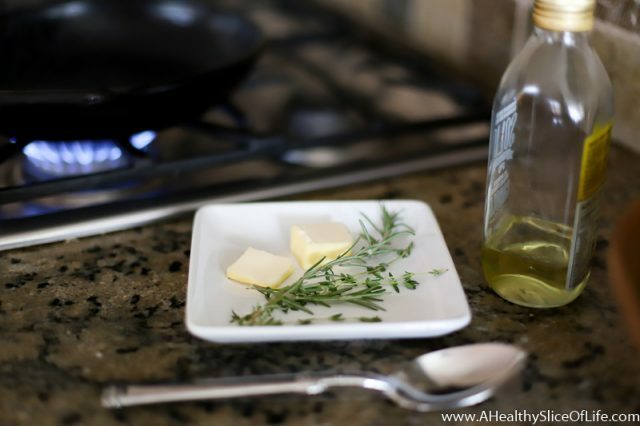 From there, it’s a quick sear in a cast iron pan with some butter and herbs for flavor and then you are ready to serve! 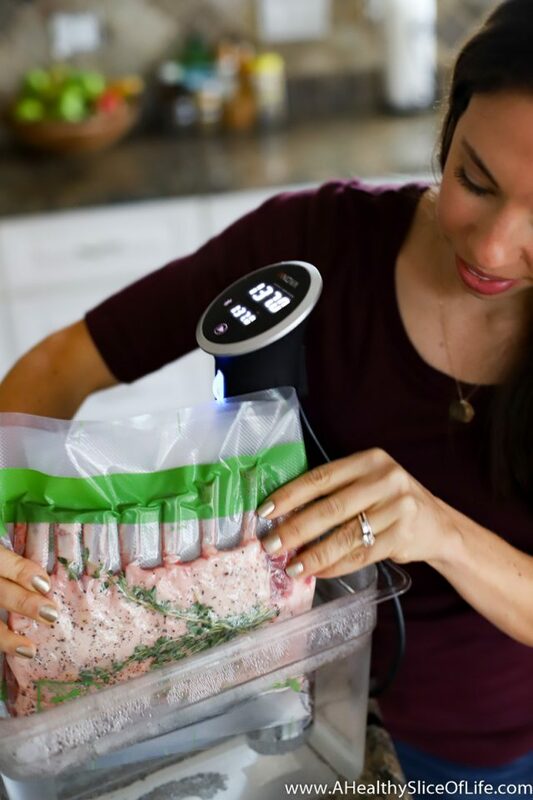 Since sous vide ensure all the juices stay inside the meat, you can skip the resting period that you need with traditional cooking methods. The FoodSaver® FM5000 2-in-1 Food Preservation System makes it SO easy to pull off a beautiful and impressive holiday dish. We’ve used this method for a variety of proteins, and it takes all the guess work out of the process leaving us with tender steaks, juicy chicken, and pork that isn’t dry (sous vide is an excellent choice for proteins prone to drying out, like pork or duck). Trust me, you’re going to knock their socks off! 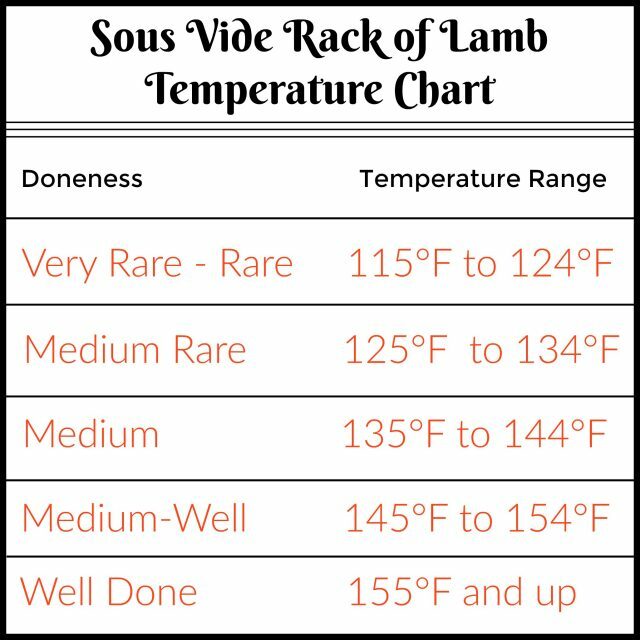 Preheat a sous vide water bath to desired temperature (based on chart above for how well done you want your lamb to be). 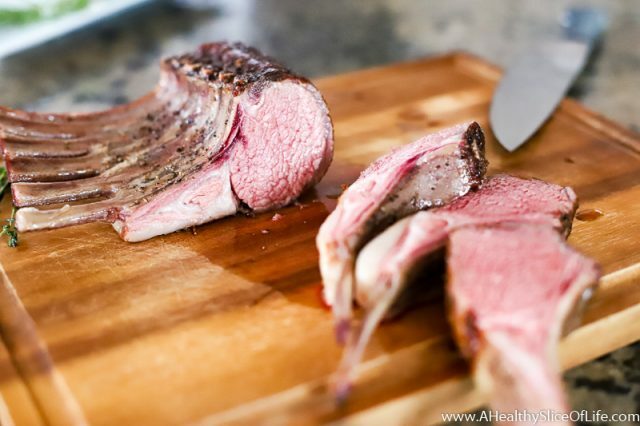 Season lamb on both sides with salt and pepper. 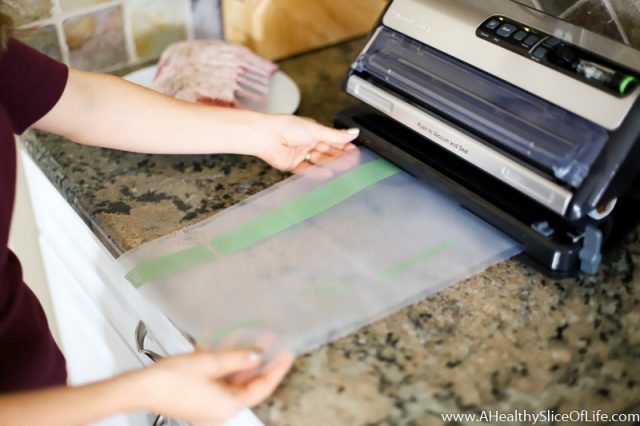 Place the rack inside a FoodSaver® Vacuum Seal Bag. Top with 3 sprigs of rosemary and thyme. Vacuum and seal the bag. Place bag in the water bath and set a timer for two hours. 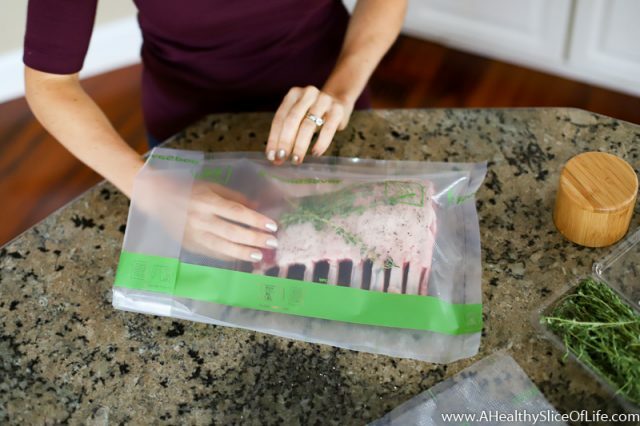 After two hours, remove lamb from the bag and pat dry with paper towels. Heat vegetable oil in a heavy cast iron or stainless steel skillet over high heat. 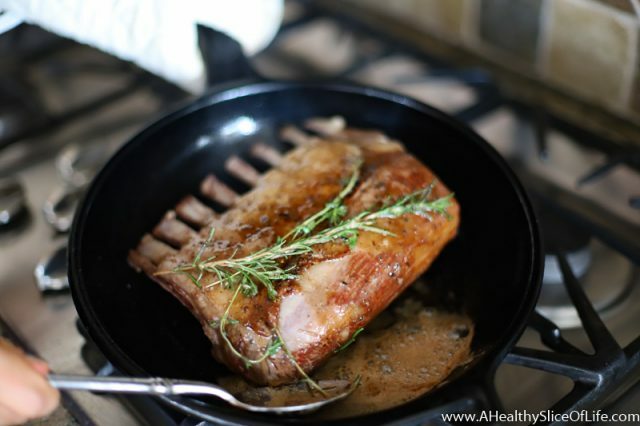 Once hot (it will be smoking), place the lamb, meaty side down, in the skillet. Use caution, as the oil will be very hot. Add the butter and remaining rosemary and thyme. 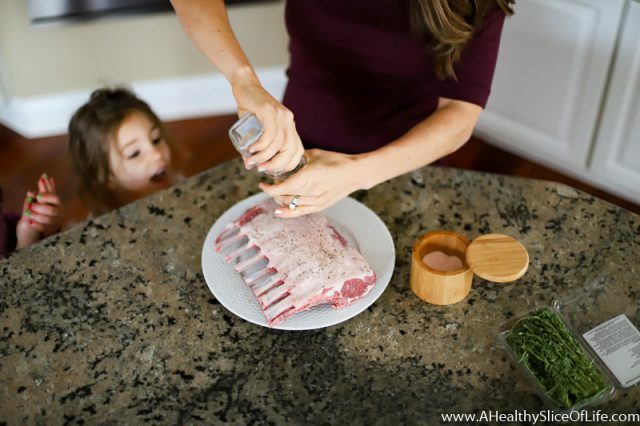 Baste the lamb with the melted butter and herbs on both sides until browned, 1-2 minutes. That is quite impressive! Looks delicious!